Recent climate reports say the Western Antarctic Ice Shelf (WAIS) has reached a tipping point. Comparatively warm water is coming up and melting it from beneath where it’s attached to land, and all that’s keeping it from working its way into a lower-than-sea-level valley where it can loosen the entire WAIS is a granite bulge. There is no stopping it from cresting that bulge; the only question now is when. At the moment the predictions are that water will continue to rise on the order of millimeters per year for two centuries as six major, leading WAIS glaciers melt, putting about 1.2 meters (4 feet) of water into the oceans. Without those glaciers in place, the rest of the shelf becomes vulnerable, and its melting and/or displacement means an additional 2.4-3.6 meters (8-12 feet) of water in the oceans. For some visual reference here, check out an artist’s photorealistic renditions of US cities after 3.6m of water rise. In the meantime, Greenland is shedding water into the ocean at a rate of about .55 millimeters a year, with its ice loss being responsible for about 4% of the approximately 18cm (7 inches) of water rise over the past century. Scientists are looking at Greenland’s melt as the possible most worrisome problem of the 21st century, as, if all its ice should go, the sea level would rise by over 7 meters (23 feet). But I’m pretty sure that what most people see is “.5m” (.01 inches) and what most people think is “Pffft.” I mean, come on: continents are vastly more dramatic than that. Given average continental drift speeds, the continents have moved 2 meters (6.6 feet) in my lifetime. SIX AND A HALF FEET. ENTIRE LAND MASSES have moved SIX AND A HALF FEET in the past 40 years, and scientists want people to get excited about 7 inches of water rise in a hundred years? Well, personally, I sure as hell want people to get excited about that. Not because 18cm is all that much rise (except it is if you live somewhere low-lying: do not imagine that that gradual creep of water did not affect what happened in New Orleans with Katrina), but because time and again we are seeing that climatologists, even when they’re getting bolder, keep underestimating how fast things can change. A few years ago an ice shelf came off Greenland–an event ice-chasers thought would take decades–in a couple of hours. That’s a blink in the terms of a human lifespan, nevermind geologic time; geologic time can’t even account for something that fast. And that’s not the only example; the WAIS data mentioned above is exactly the same kind of surprise to the scientists studying it. It’s proving to be far more sensitive to temperature changes than previously expected. The list goes on, too. So when I read these articles citing a century or two centuries, and when I look at the drastic changes being seen in my home state, I can’t help revising the numbers downward by orders of magnitude. If two hundred years becomes two decades, or a century becomes ten years, those microcosmic increases that most people can’t be bothered to worry about are suddenly going to be forgotten in the deluge. The world is changing, goddamn it, and humanity, with its astonishing ability to adapt, is still for the most part enjoying its bread and circuses. We can do better than that. We should do better than that, because it doesn’t matter if it falls down or rises up: the water is coming from Zion. I borrowed that link and put it up on Facebook. Creepy!!! I've seen what my beloved NYC will look like, once those waters come down. Waterworld was a crap movie. I really don't want to be living it. I don't know which is scarier--the reality of the situation, or the fact that there are still so many people who don't seem to grasp how very, very much trouble we are in. we wont have to worry about Bangladesh, since its so close to sea level all the time, it will be gone. You are 100% right on this, Kit. The conservative estimates have been saying 3-5 feet by the end of the century, and every indication is that the conservative estimates are turning out to be wrong, possibly 'way wrong. 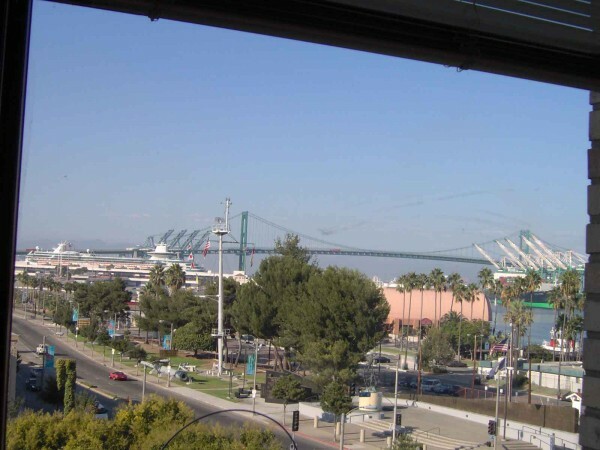 I'm getting tidal complaints from a location that never had tidal influx before, in the Los Ang harbor area, and the Port is blissfully working away (as far as I hear in casual conversation) with no plan for what to do if a drastic rise occurs, like a sudden ice shift. Seven meters puts almost the whole Port, one of the largest in the world, underwater, and water in the lowest floor of our building. Harbor Blvd in the photo is at about 21 feet, a little less than 7 meters. As you note, feasible- not unrealistic- senarios include 7 meters for Greenland ice, and another 7 meters for (I believe) the East Antactic Ice Shelf, not counting the one you mention. People are not letting this into their consciousness, and it is happening. Think of the CO2 saving, and change in traffic congestion if everyone (who really needs a motor vehicle) went to a Vespa, maybe a solar-charged one. I saw a three wheeled Yamaha scooter with a guy in a wheel chair in it, looked a a little portable pickup bed with three little wheels. And his license holder said, "Holy sh-t, mobile again!" And I got on my bicycle again for the first time in a long time last weekend. Bicycle usage depends on the local motor drivers though, for safe conditions. London's idea of charging to drive into the central city is a start. Tax the overuse of (and over-large) vehicles to death. Europe is going that direction, the US needs to follow. Bangladesh is already facing huge problems due to the rise in the water levels. This is happening. It matters.